After 'Hunger Games,' U.S. Archer Shoots For Olympic Games : The Two-Way U.S. archer Khatuna Lorig hopes to return to the Olympics this summer. But she's already helped put archery into The Hunger Games this spring — by training the film's star, Jennifer Lawrence. In the film's kill-or-be-killed competition, Lawrence's character relies on her ability with a bow. 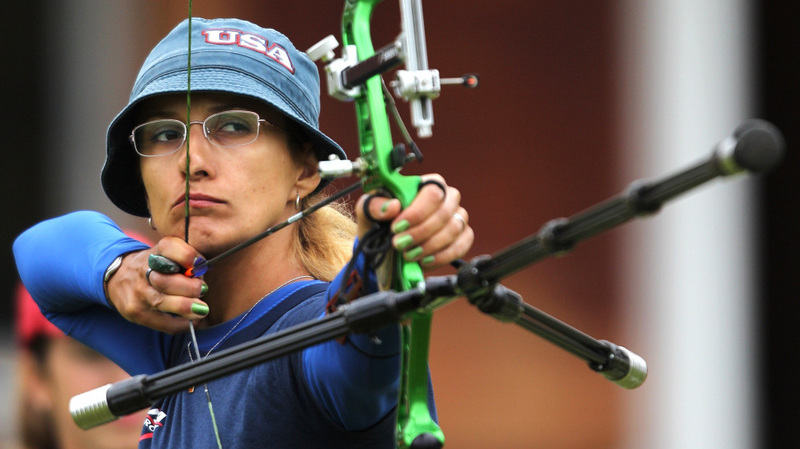 Archer Khatuna Lorig, seen here during the London Archery Classic last October, helped actress Jennifer Lawrence prepare for her role as Katniss Everdeen in The Hunger Games. "[Lawrence is] the best ambassador we have, a sort of Kevin Costner," Lorig tells reporter Alex Schmidt, for a story airing on Tuesday's Morning Edition. "I think she's the one who's gonna make archery more visible. That's what's happening — and I'm very happy," she says. It seems Lorig will have reasons to stay happy this summer. In addition to The Hunger Games, archery is featured in the upcoming Marvel film The Avengers (May 4) and the animated Brave (June 22), by Disney Pixar. Lorig reportedly worked with Lawrence for about 10 hours. And she gives the actress high marks. On the Easton Foundations sports website, Lorig says that "after a few lessons, Jennifer was shooting about 100 arrows a day with an Olympic-style recurve. Her technique was great." As for perhaps the most impressive shot in the film — in which Lawrence's character shoots an apple out of a roasted pig's mouth at a banquet — Lorig says the shot is one she and other highly trained archers could make. "Yes, we can shoot the apple," Lorig told Wendy Bounds on the WSJ Digital Network. "We can shoot very small objects, no problem — from probably 80 yards, or even more." Asked whether Lawrence is good enough to make that kind of shot without the aid of special effects, Lorig says, "She would need more practice, of course. Yes, why not? She could be." Jennifer Lawrence aims an arrow in The Hunger Games. 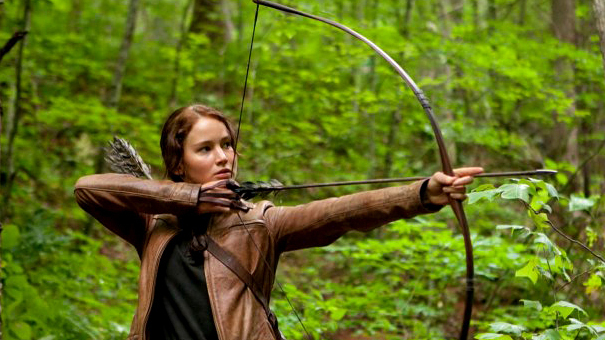 The central character of the film based on Suzanne Collins' books relies on her ability with a bow to survive. These days, Lorig is focused on her own goal: earning a trip to London for the Summer Games. She competed in her first Olympics nearly 20 years ago, in Barcelona. Back then, she was on the Unified Soviet Team. She went on to represent her native Georgia and then the United States, where she moved in 1996 — first to New Jersey, and then to California. Now Lorig wants another chance to represent the U.S. — she's the top-ranked American female archer. But she might not learn if she has qualified for a spot on the team until June, Schmidt reports. Lorig also wants more people to give archery a try. She's been a fan of the sport for 26 years. "Once you start shooting, you're gonna like it," Lorig tells Schmidt. "Come on, how can you not like archery? You have to be physically strong, and you have to be mentally strong. So what else do you need in your life?" You can watch Lorig shoot online, during a practice session at the 2008 Beijing Games.